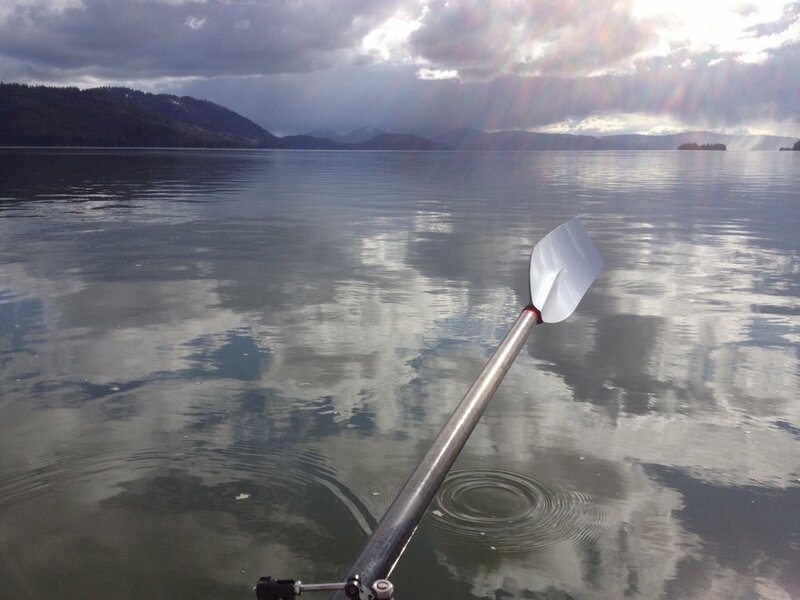 From Pat Rays of sun sliced through billowing dark cumulus clouds as we rowed by the mouth of the Stikine River, a major waterway to the interior. Flocks of hundreds of shorebirds took off and turned in unison, resembling mist rising from the water. Sea lions hauled out on a rock outcrop growled and belched in the distance. We passed over tidal flats that dry completely at low water and entered Fredrick Sound with icebergs floating like large ships on the horizon. 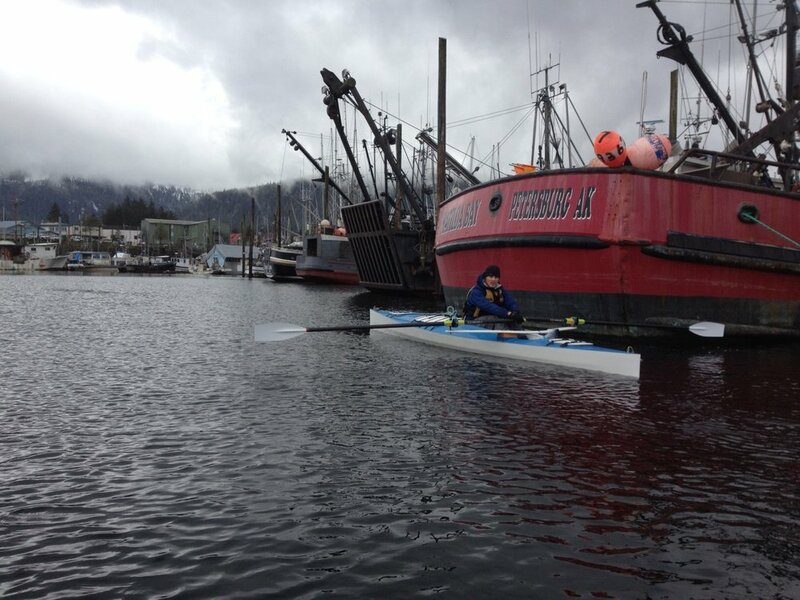 We pulled into Petersburg today for our 3rd food resupply. The proximity of the Le Conte glacier is what allowed this town to thrive in its early days as ice was a valuable commodity for packing and shipping fish to southern markets. Unfortunately a thick layer of rainclouds hid the Devil's Thumb from view as we rowed past. An early sketch of this trip more than 2 years ago entailed making an attempt to climb one of the routes on this infamous rock that thrusts out of the Stikine ice cap. The peak boasts the largest face in North America, rising 6,700', twice the size of El Capitan in Yosemite. Its sheer size combined with foul coastal weather that plaster the mountain with snow and ice has left this northwest side unclimbed, though many of the world's greatest mountaineers have attempted it. Now 42 days and 925 miles into the trip we are becoming accustomed to the boats and falling into a steady rhythm. Caroline has what might be the hardest job of the day--initiating the exit from the warmth of the sleeping bag, pulling on wet raingear, and heading out to prepare oats and coffee. Once she has left I pack up the sleeping bags and take down the wet tent. After all the gear is staged down by the water we carry each boat from its dry perch through the intertidal to the water's edge. The act of loading and launching can be tricky depending on conditions. With a falling tide over mud flats, the water pulls away faster than the boats can be packed so we load them in the water. With surf and rocks this will not work, so they are loaded at the water's edge or partially floating but still anchored to shore while all our gear is stowed in the hatches, the oars placed in the locks. We then quickly lift one full boat mostly into the water, then rush over to the other and that person launches. Then the first runs back to their boat as the waves are pushing it back sideways to the rocks and attempts to push off smoothly. A wave or two spilled into the cockpit are dealt with using two critical pieces of equipment--the milk jug bailer/pee bottle and the large sponge. Seldom do we get waves in the cockpit while we are underway, but on occasion the right one crashes onto the lap. As you might expect, breaking waves broadside to the boat are the worst, especially the wind-driven chop. Clearing the oars over the waves between strokes is prone to catching a frothy wave and giving that side a yank. In following seas the trick is to control the surf by not letting the bow get pushed sideways. Plowing head first into steep chop or closely-spaced waves is exhausting and little progress is gained. The boats have no rocker at all and tend to bridge the troughs and slice through the waves, causing wave after wave to wash over the deck. If I was to build the boats again I would construct the hatches slightly differently. That said, they work surprisingly well. The most water I have removed after a long day on rough water was a quart, but typically there is none at all. Wind direction and intensity are the biggest factors that determine our progress, even more so than currents on this trip. 11 hours and 25 miles one day may yield 40 the next, 30 the following, and then leave us stuck on shore watching the storm. On this coast, "wind in your face" or following seas tend to be low pressure, wet winds which are welcomed in moderation. "Wind at your back" or a headwind is often associated with high pressure, clear and drier conditions that certainly have their benefits. Fortunately we have had relatively few of the flat calm, steady rain for days straight periods as is typical. If the forecast is right, that may change for our next stretch to Juneau, 135 miles away.